Next, you’ll be assigned a pick up day. The night before your pick up, you’ll receive a courtesy call. Hang your bag on the specified door by 7:30 a.m. Your route driver comes and picks up – no need to call. 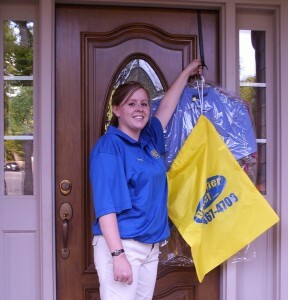 Your dry cleaning is delivered two days after your pick up. Your route driver hangs your fresh dry cleaning on the door hanger, along with your empty garment bag. Route driver knocks on door and leaves. That’s it. Simple. Easy. Convenient. If you have any questions regarding this process, check our FAQ page to see if we answer your question. If you don’t find the information you need please don’t hesitate to call [678-467-4706] Or, to get started using our service, Sign Up now!